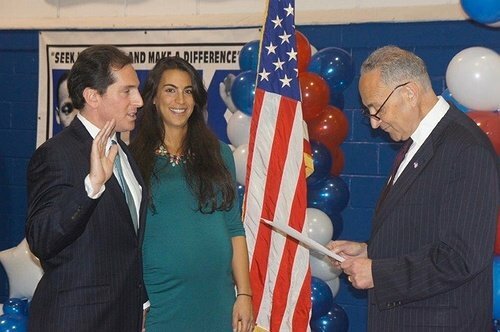 Todd Kaminsky was sworn in Sunday as the 20th District of New York’s new state assemblyman. Long Beach, NY - January 6, 2015 - Todd Kaminsky was sworn in Sunday as the 20th District of New York’s new state assemblyman. U.S. Sen. Charles E. Schumer administered the oath of office during a ceremony at the Long Beach Martin Luther King Center, joined by other elected officials, local leaders and over 300 Long Islanders. Attendees also heard remarks from Long Beach City Manager Jack Schnirman, Assembly Speaker Sheldon Silver, New York State Senate Majority Leader Dean Skelos, outgoing Assemblyman Harvey Weisenberg, Nassau County Legislator Denise Ford and U.S. Congresswoman-elect Kathleen Rice. Assemblyman Kaminsky’s inaugural address focused on the importance of local leadership, accountability and the spirit of participatory democracy. He also spoke about the challenges facing the South Shore of Long Island and Nassau County, pledging to fight for a more robust response to the financial and physical damage done to the region following Hurricane Sandy and the financial crisis. Kaminksy also expressed extreme gratitude to supporters who provided wisdom and aid throughout the campaign. "I would not be headed to Albany if not for the tireless support of my family, volunteers and key allies, such as Nassau County Democratic Chair Jay Jacobs, Assemblyman Harvey Weisenberg and community leaders from across the district," Kaminsky said. The Long Beach MLK Center was overflowing with hundreds of supportive community members and leaders, including elected officials from Nassau County, religious leaders, leaders and members from the fire and police departments, and community residents. Subject: LongIsland.com - Your Name sent you Article details of "Assemblyman Kaminsky Sworn In By Sen. Schumer In Front Of Elected Officials, Community Leaders, Hundreds Of Long Islanders"